Installation: Designed for North Facing Residences. For East, West & South facing residences see SolarArk SAV20T. SolarArk solar roof vents are an effective and very efficient way of ventilating the hot air inside roof spaces during hot summer days. The SAV20 utilizes a quiet brushless DC motor and has an impressive air flow of 2,718 m3/hr and has no running costs at all due to being 100% solar powered! Its integrated auto shut off function if the temperature drops below 24°C to preserve roof space heat in colder months which means that you won’t have to worry about turning the fan on and off! During hot days in Summer solar heat causes roof spaces to increase in temperature, often exceeding 70°C! Consequently this greatly increases the temperature in your homes and reduces the effectiveness and efficiency of any cooling systems being used inside. It also increases the chances of any mould or condensation being built up in roof spaces due to the hot trapped air. The SolarArk Solar Powered Roof Ventilator SAV20 model is designed to reduce roof temperatures by up to 30°C and room temperatures by up to 6°C by extracting out the hot air within roof spaces on hot days. This will reduce the build up of mould and condensation within roof spaces that can effect the health and quality of air inside homes and living spaces. 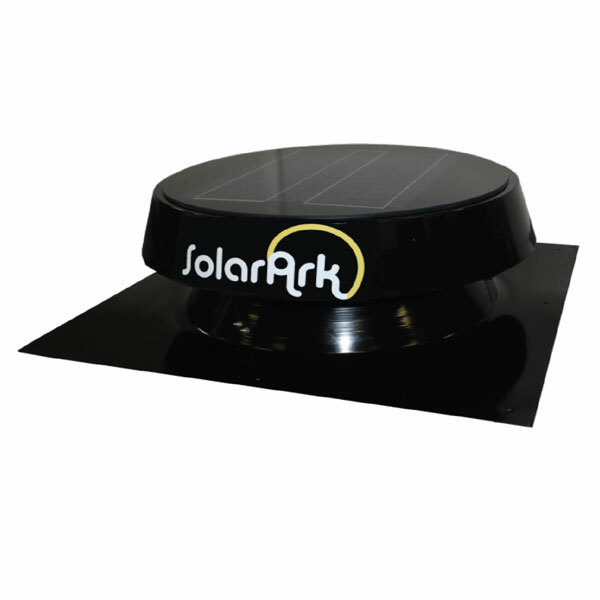 The SolarArk Roof Ventilators are 100% solar powered and as such have no operating costs at all!